Simple, sleek, swift, smart. Do. GNOME Do is inspired by Quicksilver & GNOME Launch Box. If you know what you're looking for, Do will help you find and act on it faster. Send emails & IMs, play music, search the web, and launch applications too. Do is just as sleek, swift and smart on KDE and other common environments. Post your status to Twitter or Identi.ca, and get notified when your friends post. Instantly search your Google contacts and their contact details. 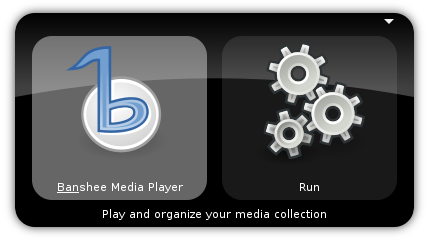 Control playback, browse your music library, or search by artist or album. Do things as quickly as possible (but no quicker) with your files, applications, contacts and more! © GNOME Do Developers. All rights reversed. Contact us.